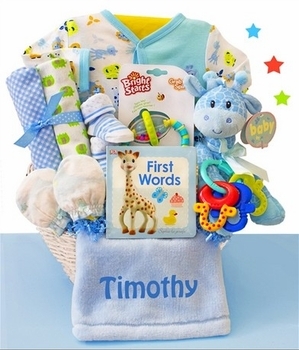 This unique baby boy gift design features the popular safari theme filled with useful infant items. Toys, necessities, 2 security blankets and a minky soft travel blanket we can embroider the baby�s name onto to really make this an exceptional gift for any newborn boy! Makes the perfect shower gift and comes gift wrapped in opaque white tulle material. Really impressed with this gift basket. Everything looks just like it does in the picture and the blanket with his name looks terrific!